Making Sense of Crane Classifications | EMH, Inc. When you find yourself in the market for an overhead crane there are a lot of things to consider including the overhead crane classification. A Infrequent or Standby Class A overhead cranes are used in environments where infrequent use is all thet is needed like powerhouses, public utilities, turbine rooms, motor rooms and transformer stations. These overhead cranes are also ideal when precise handling of equipment at slow speeds is needed. B Light Class B overhead cranes are typically used in environments that include repair shops, light assembly operations, service buildings, light warehousing, etc., where service requirements are light and the speed is low. For these overhead cranes we are talking two to five lifts per hour. C Moderate Class C overhead cranes are built to be used in machine shops or papermill machine rooms, etc. where service requirements are moderate. Class C overhead cranes can handle loads that average 50 percent of the rated capacity with 5 to 10 lifts per hour. Overhead cranes that are rated D are used in environments that include heavy machine shops, foundries, fabricating plants steel warehouse, container yards, lumber mills, etc. These overhead craned include standard duty bucket and magnet operations where heavy duty production is required. Loads approaching 50 percent of the rated capacity are handled constantly by the overhead crane during the working period. E Severe Severe, or class E overhead cranes handle loads approaching their capacity rating throughout the life of the overhead crane. These overhead cranes handle twenty or more lifts per hour at or near the rated capacity. F Continuous Severe Class F overhead cranes are capable of handling loads approaching their capacity, continuously, throughout the life of the overhead crane. These overhead cranes must provide the highest reliability with special attention to ease of maintenance features. 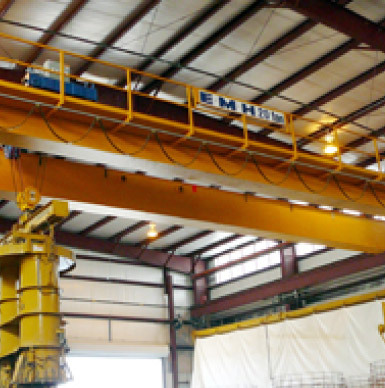 EMH has numerous overhead crane options and we are happy to help you choose the crane that is right for your needs.